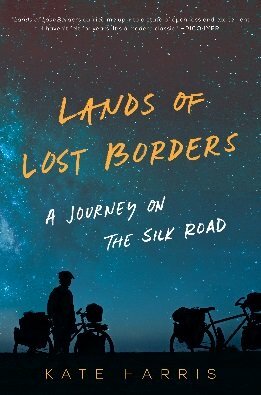 An, “Inspiring, moving, heartfelt, and often breathtaking,” story about riding 4350 miles of the Silk Road should be on your summer reading list. While Cheryl Strayed’s journey on the Pacific Crest Trail in Wild was spurred by the traumatic loss, it seems Kate Harris’s journey had been waiting to be taken for her entire life. From a very young age, Kate felt called to explore; first looking outward toward Mars with dreams of becoming an astronaut. But in between her studies at Oxford and MIT, during an impromptu bike ride on the Tibetan Plateau, Kate realized that the farther she traveled here on Earth, the closer she came to a world as wild as she felt within. She decided to quit her Ph.D. program at MIT and instead set off across the fabled 4,350 miles of the Silk Road with only her childhood friend, a backpack, and a bicycle. She chose the Silk Road because of how enamored she became with the Tibetan Plateau when she first visited between her studies a few years prior. In Lands Of Lost Borders, Kate writes a beautiful narrative, a sense of wonder on the page, and thoughtful meditation about the world around us. With this book, Kate wants to inspire cyclists to live outside of their own lines and live life to the fullest. What you need to know is, getting to ride alongside Kate on her Silk Road journey puts the reader into the nature of limits and the wildness of the self. As a cyclist, the author of a book and the publisher of several websites, I’m always amazed at cyclists who not only give it all up to live this dream, but then write about it. And, get it published. Learn more about Kate in this CBC interview and on her site.